Celebrate 75 years of Marvel Comics cover art! Blown-up versions of beautiful comic art captioning facts and info about artist, storyline, and history. 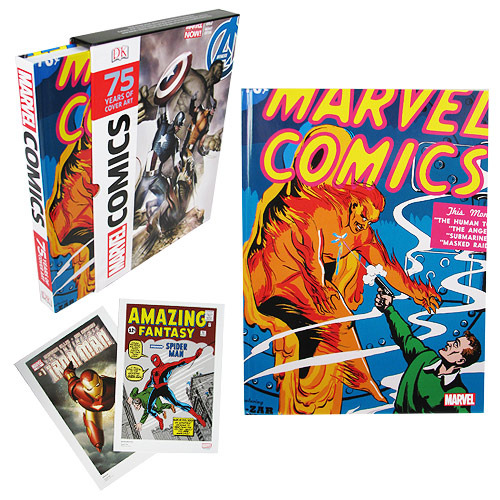 Commemorate 75 years of Marvel Comics with this beautifully illustrated Marvel Comics 75 Years of Covert Art Hardcover Book! Packaged in a slipcase with a fun cover featuring Wolverine and the Hulk, this book spotlights the most iconic covers along with concept art from all over the world. Featuring the likes of Spider-Man, Iron Man, and The Avengers, as well as the writers and artists who gave them life, including Jack Kirby and Stan Lee, the 75 Years of Cover Art book brings together the most beloved Marvel characters like no other has done before. Spreads include blown-up versions of the beautiful comic art capturing every detail while captioning facts and information about each cover's artist, storyline, and history. 320 pages. Measures 14-inches long x 10 1/4-inches wide. Ages 12 and up.